These days, the Web is always with us. Thanks to an ever-increasing number of always-on devices with great browsers, the Web is a constant companion in our lives. This continuous connectivity allows us to build new experiences that rethink how the Web can work -not just on one device but across many. 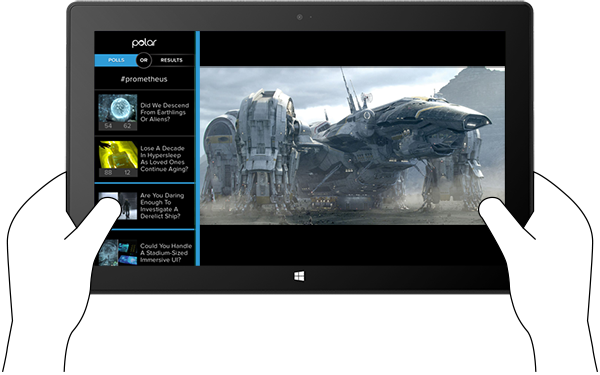 To explore these possibilities we teamed up with Microsoft to create a Companion Web experience for Polar. From hyperlinks to social networks, the Web has always been about making connections between information, people, and now... devices. Whether tablets, smartphones, or TVs, today’s networked devices ship with the best Web browsers we’ve ever had to work with: Internet Explorer 10, Chrome for Android, and Safari for iOS for starters. The combination of better browsers, new devices, and how they’re used allows us to rethink what the Web can be -to create new experiences for this new reality. Consider more than 80% of smartphone owners in the United States use their device while watching TV and even back in 2011, 20% of time spent on a smartphone was in front of a television. Despite people’s frequent simultaneous use of these screens, they’ve remained separated by different operating systems, input devices, and apps. So while the amount of connected devices in our lives has grown, their connections to each other have not kept pace. The Web can help by connecting our screens and applications so we can build cohesive experiences that take advantage of what each device in our lives does best. These Companion experiences represent the next evolution of the Web and we’re excited to be working with the Internet Explorer team at Microsoft to explore this new terrain for Polar. Polar allows you to easily share your opinion on any topic from iOS7 icon design to summer foods. We built a Web experience that not only looks good on different sized screens (smartphones, tablets, laptops, etc.) but also works great with different kinds of input (touch, mouse, keyboard) as well. So you can use Polar on the Web wherever and however you like. But where and how people use the Web keeps changing and increasingly involves more than just one device. 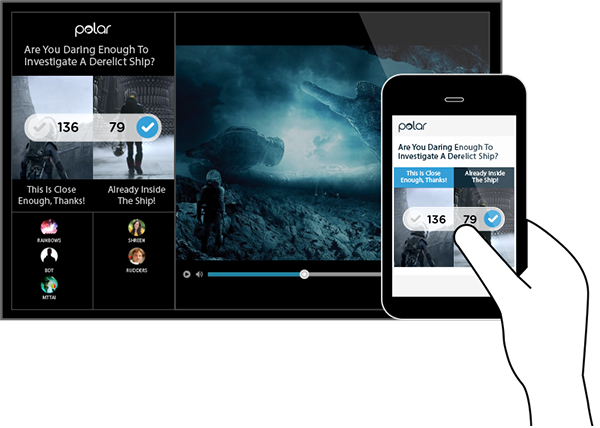 So our new Companion Web experience for Polar isn’t just designed to be accessed on a wide range of devices, it’s designed to work simultaneously across these devices as well. 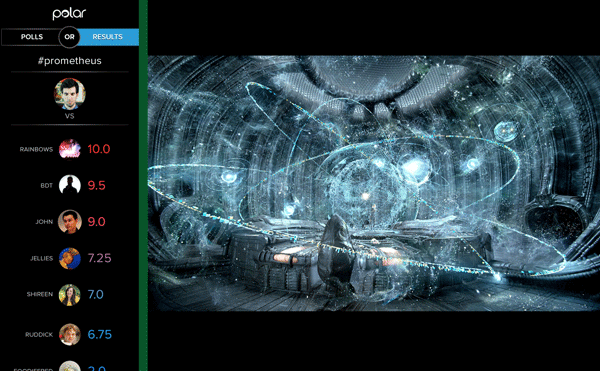 As you can see in the video above, the Polar Companion Web experience complements what you’re watching on the big screen. You can leave it up alongside any film, TV show, or video you’re viewing and keep up with new opinions and questions, as they appear in real-time. 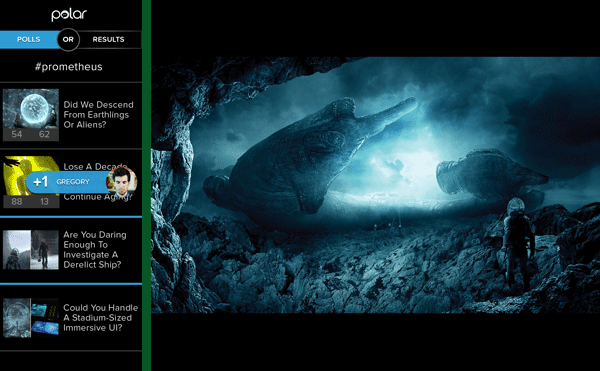 Or use any device with a Web browser to control the big screen display. When you scroll, vote, or switch topics with your connected device, the big screen experience responds to your actions: vote on a poll and see results from others instantly on the big screen; start scrolling on your connected device and the big screen automatically switches to list mode showing you totals for the polls you’ve already voted on. We’ve even made it possible to have multiple devices connected to the screen at once so you can take turns controlling the big screen experience. Once you are done voting on a topic, you can switch the big screen display over to the Results view to see how your opinions stack up against others who have voted on the same topics. This display updates in real time as others continue to vote so you can keep it alongside whatever you’re viewing to follow along. Because this is the Web, you’re not limited to just one way of using our Companion Web experience. Turn on a video on any Windows 8 laptop or tablet and snap Polar’s companion experience alongside for a single-device split screen view. Or connect any two Web browser windows you like whether they are on the same device, same operating system, or not. As you can see, the Web is full of possibilities and Companion Web experiences like Polar allow you to connect the diverse screens in your life in new ways that put control in your hands. It’s an exciting time to be building online and we’re happy to have worked on it together with the Internet Explorer Team.